Steve Miller's Math Riddles » What’s My Card? 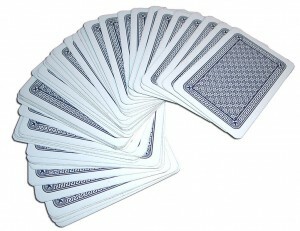 A student is given five random cards from a standard deck of 52 cards. He must choose four cards to reveal to his professor and the order in which to reveal them; his goal is to reveal four cards in such a way that the professor knows what the fifth hidden card is. How does he do this? Not sure what ‘how come’ means. Please email me at sjm1 AT williams.edu. Is it assumed that the professor and student can not work out a strategy in advance? Or can they talk first? I’m at a liberal arts college. We’re all about encouraging student / faculty interaction. We actually meet for dinner and a Red Sox game and discuss the details in Fenway Park. Could you give a hint? And from Shane’s question, can I assume from the way you answered him that the student and professor did work out a strategy beforehand? Isn’t that the soln? I mean, you are saying that you can arrange with your professor positions on the table to represent operators (next to means add, on top of means multiply, etc). So he arranges these four operators and a way to show suit (which also shouldn’t be that hard) and also a way to say “this card isn’t used” (just put them off to the side) and the question becomes “given four random numbers between 1 and 14, is it possible to arrange some of them and put operators between them so that it totals a different random number between 1 and 14?” That, I believe, is yes. I have not given exact arrangements because that is for the student and the professor to decide what is easiest for them. You’re on a possibly right track, but the question is can you make it rigorous and work? There is a very simple way to do it where you ALWAYS put the cards down in a line, and thus don’t use 2-dimensions…. Can the student see the five cards? but then he’s always showing the same thing…. email me at [email protected] to chat more. Let me try explaining the problem again. You are given 5 cards, say 2hearts, 5spades, 7diamonds, 8diamonds, Qclubs. You get to choose one of the five to keep hidden, and then place the other four down in such a way that your partner can glance down and deduce what the missing card is. You can’t ‘clue’ him in by things such as the angle the card makes with the table…..
You find two cards that share the same suit, since there is 5 cards atleast 2 will have to have the same suit. You will use one of these cards as the card you want the professor to guess for.. You take the other 4 cards, put them face down on a table and spell out the number that is the card the professor is trying to guess. 2 for 2, 9 for 9, K for king, etc. Leave the card with the same suit face up while the other 3 stay down and he should be able to guess the card. Am I right? You’re on the right track. The problem is you have to put down the other four cleanly. No rotation, all facing the same way. You control the order of the four cards, but that’s it. Could he organize them by the poker hand he holds and reveal what his hand is, eg “full house” while also organizing by increasing or decreasing numbers? If I’m wrong, please email me the solution. Thanks. Do you get to pick the order in which you lay them down? In other words, can I lay card number 1, then card 2 to its right, then card 3 to the left of those two, etc.? Or do I have to convey the final card simply with the order of the first four? if you need to do that, sure — however, it’s possible to do it by saying there are 4 boxes:    . you first put a card in box 1, then box 2, …. Can I have the answer please? is he allowed to discuss a strategy before hand? Can you please send me the solution to this 5 card trick? I have tried about everything I can think of. You lay them out with the correct spacing in between… if you have a 2,5,7,8,J…. You leave 2 card slots between 2 and 5, 2 slots between 2 and 8, and 2 between 8 and J. Then you point to the slot before the 8 and they figure it out. you can do it without doing a trick like this. in other words, you tell ME what order your want the card to be placed and I’ll place them, so no signals through delays, spacing…. Mike L: not posting as this gives away a lot. Email me at sjm1 AT williams.edu — you’re very close, but you are using more info than you are allowed. The person coming in doesn’t know the order in which the cards were placed, and the four cards must go in four specific slots with specific orientations, so no way to use that to encode info. using only the order of the four cards gives half the required information. can I use the orientation of the fifth card (e.g holding it horizontally or vertically) to convey the missing “bit” of information? Assuming the hidden card is the/a repeated suit, is it possible to do the “trick” with either card hidden, or might there be a way to do it with just one of the cards hidden? In other words, will the trick work for EVERY situation? I’m thinking that a card would be 1 to 13 (J=11, Q=12, K=13). Having four binary places can cover up to 15. But how can I make a card represent 0 or 1? Am I on the right track? Do the cards all have to be face up? Can they be put down in different positions in the row of cards in a different order? I think I have something that works if you’re allowed to convey information by putting the second card into the third slot instead of the second slot, etc.